"Look, Dimitri, you know how we've always talked about the possibility of something going wrong with the bomb?" It's a classic moment in movie history: President Merkin Muffley (aka Peter Sellers) has just called the Soviet Premier on the telephone to tell him that in the next hour, 34 US bombers will each drop 40 megatons of H-bombs onto his country. As the Premier delivers a withering blast of Marxist-Leninist abuse down the phone line, Muffley looks pained: "Well, how do you think I feel about this?" "If you take, say, fifty H-bombs in the hundred-megaton range and jacket them with Cobalt-Thorium-G, when they are exploded they will produce a Doomsday shroud, a lethal cloud of radioactivity which will encircle the earth for ninety-three years." In a MAD world there was an insane logic to the C-bomb. It certainly embodied the principle of Mutually Assured Destruction: You attack me and I'll blow us both up! That's a pretty big deterrent. Unfortunately it doesn't really work if you forget to tell your enemy that you've got a Doomsday Machine, a fact Dr Strangelove points out to the Ambassador. "It was to be announced at the Party Congress on Monday," he replies. "As you know, the Premier loves surprises." You can hear the clip of De Sadeski talking about the C-bomb in a radio interview I did about my book Doomsday Men here. 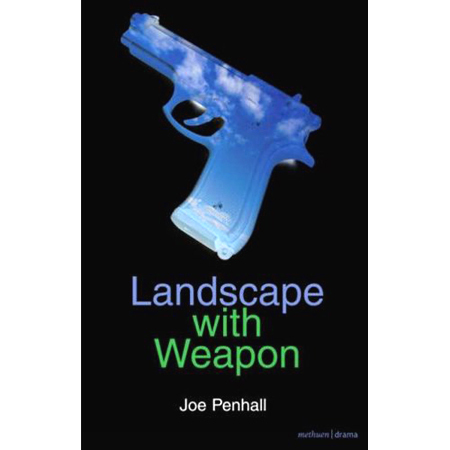 Recently I was fascinated to see that some of the themes I explored in my book are also at the heart of Joe Penhall's excellent new play, Landscape with Weapon. The world premiere was in April at the National Theatre in London. Penhall shows what happens when a scientific and engineering genius thinks he can control how his discovery is used by the military. His character Ned has invented a revolutionary type of unmanned air vehicle that doesn't need GPS to navigate. Like a flock of starlings swirling in the twilight sky, his military drones develop "intuitive emergent behaviour" which allows them to navigate themselves. Such drones could penetrate underground tunnels and bunkers in pursuit of a target. Initially, Ned intended them for surveillance, but the military quickly saw the offensive potential and "weaponised" them. "as well as being a weapon...it's a 'deterrent'. A-a-a-a psychological weapon, it's so frightening and and and appalling...it works without even being used..."
Heard the argument before somewhere? But, of course, the arms race didn't end with the thawing of the Cold War. There may not have been any WMD in Iraq but there are still tens of thousands of nuclear weapons around the world. And somewhere, in a town near you perhaps, today's Strangeloves are still chasing the dream of the superweapon. As Oppenheimer said about the original plans for the hydrogen bomb in 1951, they were "technically so sweet" that scientists and engineers couldn't resist the challenge of turning them into reality. In the first half of the twentieth century, the superweapon promised to solve the most intractable problem facing humanity - to end war. In the many examples of novels and plays about the superweapon, the saviour scientist emerged from his laboratory carrying the technological solution that would make war redundant overnight. Penhall's Landscape with Weapon is the most recent contribution to this genre and a compelling drama too. 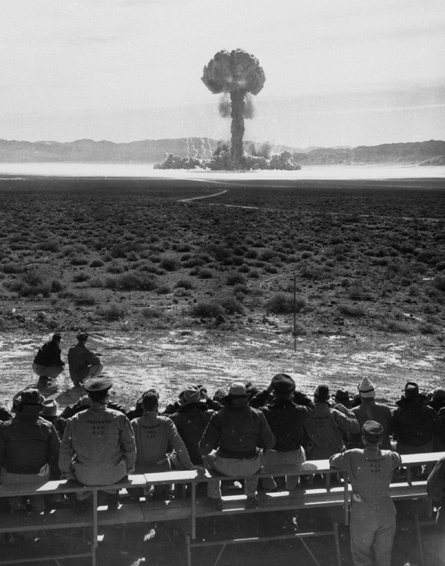 At the start of the play, Ned - like the real scientists Fritz Haber and Robert Oppenheimer - thought his invention would prevent or even abolish war. By the end of the play not only has he lost control of his technology, but he has learnt that such inventions - however brilliant - cannot end war; because as Ned says they are "technological solutions for a human problem". If only we too could learn this lesson, we might avoid repeating the mistakes of the last century. 'The Monthly's article is more detailed but also by Gideon Haigh. If anyone reading this wants an overview of Nevil Shute (I'm sure he is mentioned in PD Smith's 'Doomsday Men' as contributing to nuclear lit-culture) the Sunday Telegraph article is worth checking out. 'On the Beach' is still a great read. Resonant, sad. The film of On The Beach is one of my favourites, chilly and humane at the same time. Interestingly, I bought Doomsday Men recently, because the subject still fascinates me - an utterly gripping book of polyphonic complexity. I was surprised that a lot of critics dismissed Ned, the character in Landscape With Weapon, as naive. My brother is a weapons designer and Ned's qualms - and his very human attempts to control his destiny and not give in to cynicism - are the same as my brothers. One or two rather curmudgeonly theatre critics thought Ned's naivety and his vacillating were implausible. But, really, how would they know? Thanks for the comment, Joe, and for the kind words about my book. I thought your play was great - it touched on so many of the same themes I was exploring in my own work and I've often thought of it since then. My book was historical, so it was wonderful to see a new play confronting these issues, making them relevant for today's audiences. I didn't think Ned was implausible. On the contrary, I thought he was a memorable character. And he is so right when he says all these superweapons are just "technological solutions for a human problem". That's the tragedy that the Dr Strangeloves never quite grasp.